At Washington Water Heaters, we know that Tankless water heaters, storage water heaters, and hot water re-circulation systems can all be energy efficient; a new system of any type may provide considerable energy savings over an older system. We have been serving the greater Seattle, Tacoma, and Bellevue areas for years, and are dedicated to bringing this energy savings to you. Whether you live in Kent, Issaquah, Kirkland or Renton, our team will work with you to find the hot water system that fits your needs the best, and provides you the maximum energy savings at the same time. Any new hot water heater you examine will have a sticker showing you the energy factor (EF) of the heater. The Energy Factor takes into account how efficiently water is heated in the first place, how much heat is lost as water is stored in the tank, and heat loss as water moves through the system. A higher energy factor indicates a more efficient water heater. 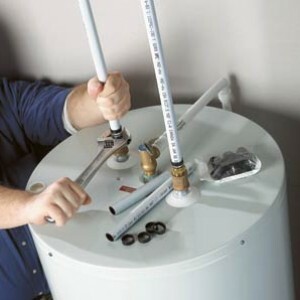 In general, among storage hot water heaters, electric water heaters tend to be more energy efficient and have higher EFs than gas water heaters because some heat is lost through venting the gas heaters. However, the energy efficiency of gas water heaters has been improving and now comes close to that of equivalent electric heaters. Tankless hot water heaters boast high EFs compared to storage heaters because their burners are much more efficient and because stand-by loss is eliminated. When evaluating the energy efficiency of a hot water system, bear in mind that energy efficiency is only one factor in your choice of a system. Your decision needs to take into account your patterns of water use, your local energy costs, and the energy options available to you. Energy efficiency is only one helpful guide along the way.